Monty has moxie, but is that enough to best Smithers’ sticktoitiveness? On Feb. 20, 1992, America’s most important cartoon sitcom, The Simpsons, aired an episode entitled “Homer at the Bat.” The episode featured nine guest stars, all active major leaguers. 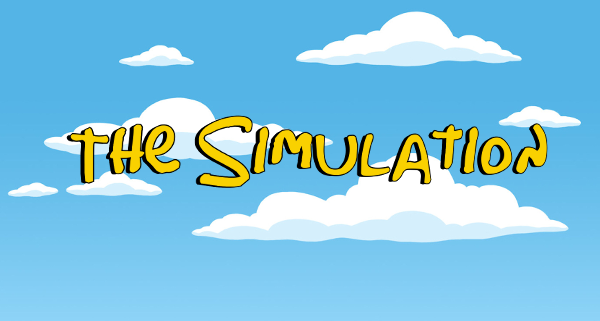 It became the first Simpsons episode to win its time slot. The fascinating cultural impact of that episode is a well-trod and well-worthy road. Let’s instead turn our eyes to the ever-lasting ache of baseball fans, the itch that spawned sabermetrics and advanced baseball analytics: Let’s construct impossible hypothetical situations between players divided by eons of baseball evolution. Let’s find out which was better: the Burns team or the Smithers team. The episode begins with Homer rallying his coworkers to join a down-on-its-skill company softball team. Homer promises to provide a secret weapon, and a funny montage homaging and riffing on The Natural ensues. When Homer’s lightning-bat-guided softball team begins winning, the company owner, Mr. Burns, and his loyal stooge, Mr. Smithers, place a $1 million wager on their team against a fellow aristocrat’s company team. 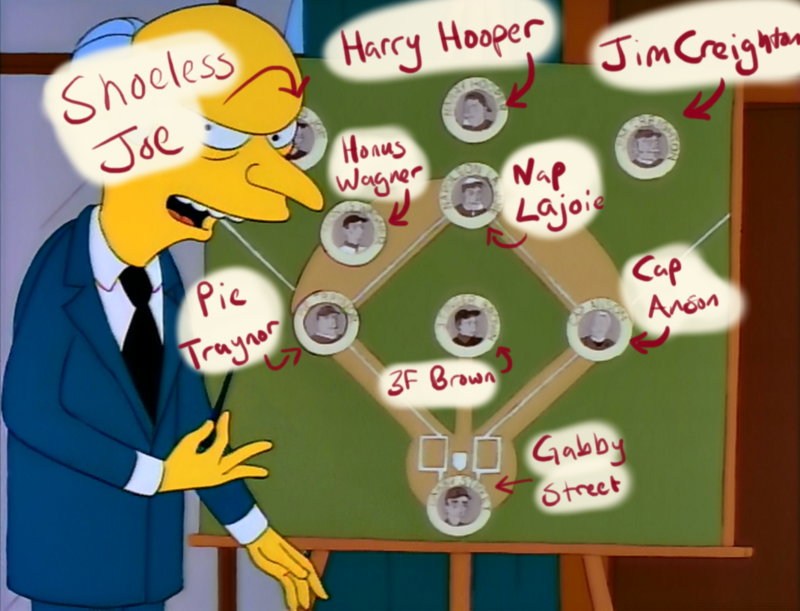 Naturally, as is consistent with literally the roots of professional baseball, Mr. Burns immediately sets out to load the roster of his amateur softball team with professional baseball stars. This, dear friends, was the age before high definition. So discerning and confirming the names on Burns’s roster is no small feat. I began by purchasing the episode on Amazon’s streaming service, but the definition proved slightly insufficient for my needs. I contacted my brother-in-law, who co-runs the MovieTown Movie Club podcast and who also happened to have the Simpsons Season 3 DVD handy. Well, make it 152 years this October. 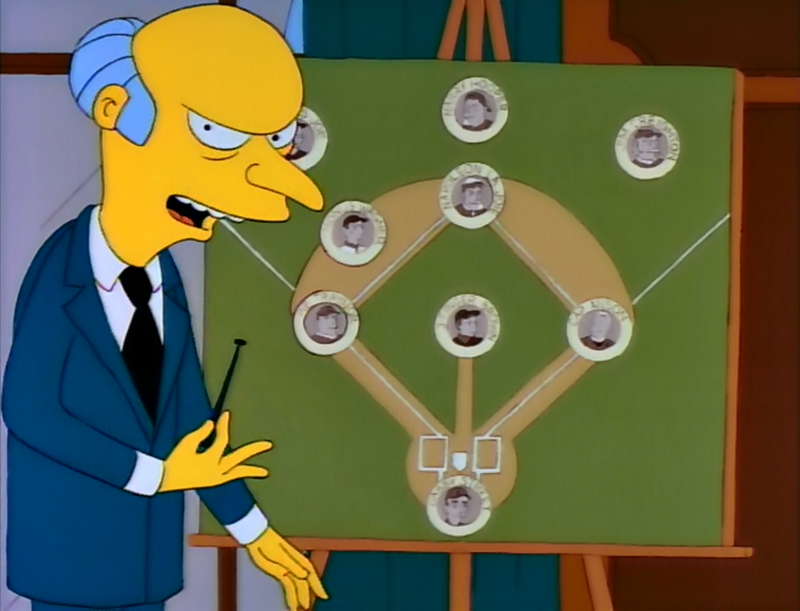 We cannot help but ask — given that Mr. Burns offered a lineup including six Hall-of-Famers (plus the great Joe Jackson, who is/was HOF material, ‘cept for all that Black Sox business) and Mr. Smithers offered a lineup of nine All-Stars and two Hall-of-Famers (plus Griffey, who will be soon, and Clemens, who should be, eventually) — which team was better? You, like me, are no doubt making the obvious conclusions: Well, if one team had six Hall-of-Famers and the other has only twoish, then the Burns team is clearly better. All-Stars are great, but plenty flash-in-the-pan types can find themselves in the Midseason Classic. The Hall of Fame tends to be more choosy than friendly. “Three Finger” Brown’s historical ability to beat his fielding independent pitching (FIP) numbers pushes his team’s value just above that of the Smithers team. But these players aren’t being called upon to play 10 seasons of baseball, just one all-important softball game. And since we’ve resurrected dead players, why not bring them back at their peaks? The Burns team jumps back into the lead! Even without Mordecai’s ERA-whooping talents, the average (or prorated, in this instance) performance from the Burns team decimates what turns out to be a rather down year for all but the great Ken Griffey Jr. Yes, it’s obviously not fair to compare a single season to an average of seasons, but since Mr. Burns does not give us a single season to give context to his expectations, we have to assume his roster was built on the general impressions left by these historic players. And since his players’ career don’t all overlap, we have to either pick an arbitrary date or expect an average of their career performances. But it isn’t so obvious. Attributing 0 WAR to Creighton is fine if we also attribute him zero plate appearances, but he’s going to get at least four in this hypothetical game. And in those charts above, all the other position players are getting 600. Giving Creighton 0 WAR assumes a replacement-level performance, which is a problematic assumption. The non-Hall-of-Famers on the Burns team, well, they frankly aren’t that great. Jackson was a gift to humanity, yes, but Gabby Street was a “Feh” catcher with a brief career in the majors, and though Creighton may have been the best player of his era, he basically didn’t play baseball. He essentially played four-sided cricket. Which brings us to the problem of context. Let’s say Mr. Burns splurged on a time machine. And after pumping the velocitator and levering the deceleratrix, he transported himself to the peak age of each of his players. These peak players, now competing against early Steroid Era players, how would they fare? Steroids or nay, the physical and sport sciences have vastly improved training systems over the last century. So how good would Honus Wagner or Joe Jackson be if they just appeared in 1992 to face contemporary All-Stars? The Steroid Era gets a bad rap, I think. In my humble opinion, the worst performance-enhancing blight in the history of baseball was the systematic rejection of African-American and non-white athletes through baseball’s so-called “Golden Age.” The fact that Jackie Robinson, age 27, eviscerated Triple-A pitching in 1946 and immediately became an MVP candidate in his first season in the major leagues; the fact that Satchel Paige, at age 41 and with no time spent in the minor leagues beforehand, became an above-average swingman and reliever; the fact that Irish players were denied starting positions for no reason other than their names suggests the pool of talent in the early years, the level of competition, was artificially suppressed. Winning the WAR game is not sufficient when the key concept behind WAR — the replacement level — is not even close to equal. A team of Dan Johnson, Scott Moore, Matt Palmer and a bevy of other Triple-A frequenters would theoretically obliterate a lineup of similar fringe-major league talent from 1930. In 1908, Wagner had a filthy .354/.415/.542 slash and a 194 wRC+. Drop that to a .292/.353./.551 slash or thereabouts and indeed, we’re still impressed. In Cramer’s research, we are seeing the quality of league talent increasing by 0.1 percent per season in terms of the statistics he observed. If we wanted to get daring and suppose that talent build applied to linear weights hitting metrics too, we’d say Wagner could manage a 178 wRC+ or thereabouts if he had his 1908 season in 1993. That’s peak Wagner, his best offensive season. But it does not consider the veritable arms race (heehee) with respect to velocity and pitch types. Wagner faced the spitball, yes, but he did not face 90 mph pitches — and certainly no 100 mph pitches. The major league skill level certainly increased during Wagner’s 20-year career, but that came in such subtle increments that he — and those around him — were able to adjust relatively easily. Transporting him to the 1990s would give him baseball’s equivalent of decompression sickness. 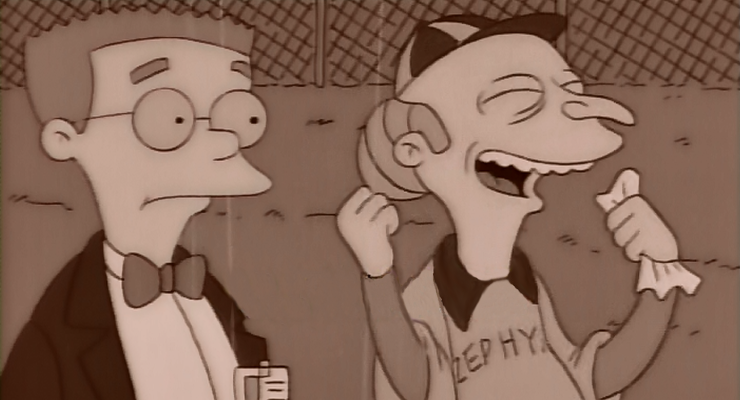 But if Burns has a time machine, why not bring a 23-year-old Wagner to 1989 and give him a few years to train up for the softball game. What then? Is baseball talent born or is it built? Is it nature or nurture? But Jim Creighton. What do we do with the league’s first star? Creighton is a fascinating guy. He is often believed to be the first professional baseball player — remember when I mentioned Burns’ hiring of ringers being consistent with the roots of pro ball? When the Brooklyn Excelsiors paid him to join their roster in 1859, the world of baseball was strictly and proudly amateur. Creighton, in truth, was the original ringer. He was also one of the first to live out the old baseball maxim: “If you aren’t cheating, you aren’t trying.” (See this delightful comic for the artistic version of those details.) But Creighton’s game was not Mattingly’s or Sax’s game. 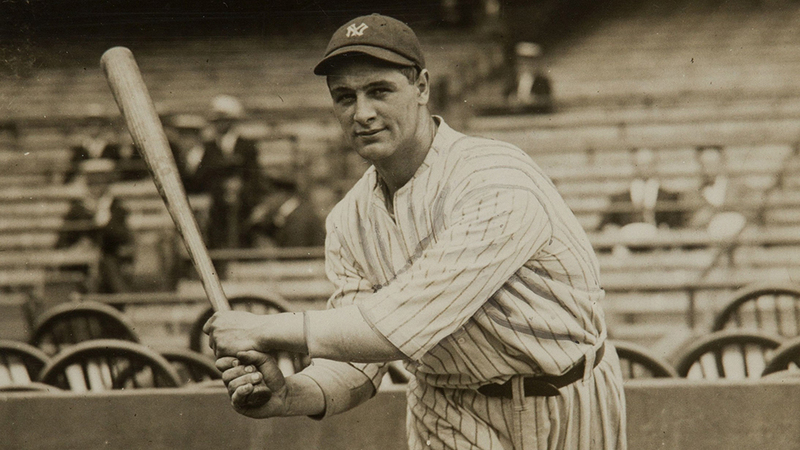 Creighton — both the game’s best pitcher and hitter — played ball in an era where it was illegal to bend the wrist when pitching (though he was accused of doing exactly that), and his hitting stance and motion — the very oddity that ultimately killed him — was more in line with cricket techniques than anything like a baseball hitter’s swing. Creighton’s swing action definitely fits the occasional cricket swing or maybe a baseball drop bunt. A year or two might simply not be enough time to train Jim Creighton to be a pro player. Let’s address that pachyderm in the office: Wasn’t this a slow pitch softball team? Wouldn’t Mordecai Brown’s famous sinker not sink? 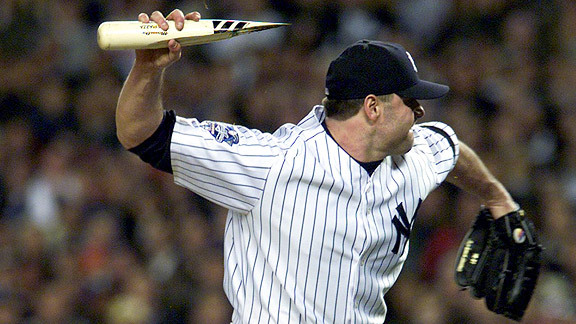 Wouldn’t Roger Clemens’ famous fastball not fastball? Well, we know from the practice footage that Roger Clemens is throwing hard. But is it underhand? In fact, Clemens throws so hard his pitch rips Homer’s Wonderbat asunder. But then there’s this problem in the penultimate scene: While receiving a delightfully over-complicated signal from Mr. Burns, our hero — Homer Simpson — gets pegged in the face bone with what appears to be a fast, quite linear pitch. So are they throwing underhand or overhand? Is it slow pitch or fast? Since when does a slow pitch league award bases on a HBP? The Amateur Softball Association (ASA) 2014 rulebook has only one mention of HBP from what I can tell (Rule 7, Section 5F) which says it’s a ball, but only for specific, slow-pitch league types. There are two possibilities for this game-ending HBP to make sense: (a) The league is indeed a (underhand) fast pitch league, or (b) the league has a special HBP rule. Given there are far more underhand fast pitch deliveries early and late in the episode, we have to assume this is a fast pitch league, so that could mean good things for our impressive pitchers. Would Brown and Clemens have an advantage over Joe Beerleague when it comes to underhand pitching? As a veteran of many a terrible softball team, I can confirm there is a special skill necessary to be an accurate and effective slow-pitch pitcher, much less a fast-pitch pitcher. Those with less experience in slow pitch may not realize: (a) The distance from mound to plate is a fairly incredible distance to underhand a ball — it’s probably the furthest one would ever choose to underhand toss anything — and (b) just as with baseball, pitchers employ a variety of grips and wrist actions to add spin to the ball. Obviously, the effect is muted with slow-pitch rules, but good pitchers will still have a variety of pitch types — maybe even a knuckleball. What we need to know is whether Clemens and Brown could somehow translate their pitching ability to softball games. Brown was originally a third baseman; maybe there’s reason to think he could field his position well. And maybe given the physical oddity of his right hand, he could manage some unusual spin and drop on his pitches. Given the footage in the episode, we can also assume Clemens’ arm strength translated in hard, accurate underhand throwing. Believe no illusions, though. The methods of underhand and overhand pitching are quite different. Since we know these players had some serious training time, I think it’s reasonable these Hall of Fame-quality pitchers could learn how to pitch effectively with the new motion. Yes, it’s a team full of great players, but Griffey has to be higher than sixth — certainly higher than a later-career Don Mattingly. Moreover, Burns pushes a toxic brain tonic on his players, and he pinch-hit for Darryl Strawberry! He’s aggressive, eager to win, and thoroughly incompetent. We don’t know much about Smithers’ managerial preferences. He is a go-getter — having signed nine star baseball players in just 24 hours — but without any real responsibilities, he does not show any particular sports leadership abilities. We’ll have to assume his managerial abilities are just average. He’s going to set his lineup according to batting average, steals and home runs. I thought about a dozen different ways to do this. I thought about using Markov chains, running simulations through different websites, making custom OOTP rosters, and ultimately decided on something uncommon. Instead of running these lineups through 100 simulated games, I would do one game. Just one game. And in the spirit of Dungeons and Dragons, I would let chance decide the master strokes and the dungeon master (me, in this instance) decide the details. The methodology will be simple: For the Burns team, I will take career average PA result rates (walk percentage, singles percentage, etc.) and then use a simple Cramer 0.1 percent adjustment (as discussed above). I will then take the PA rates for each of the Smithers players, using their 1992 statistics. Why 1992? Because I want to give them a chance, and because this game theoretically took place close enough to that season that they would still be near that ability level. Then, using a random number generator, I will calculate the results of their PAs and construct a box score. Once a pitcher has gone through the lineup five times, he will tire and be replaced with a reliever (Jim Creighton for the Burns team; Jose Canseco for the Smithers team — because Jose actually pitched an inning in 1993). The reliever will be less effective than the starter (Creighton will be 30 percent worse than Brown; Jose will be 50 percent worse than Clemens — because Creighton actually was a pitcher and Jose was not). Lastly, and most importantly, Homer Simpson will be on the bench for the Smithers team, and Otto Neu will be on the bench for the Burns team. They’ll enter the game in right field as a double switch if/when the starting pitcher leaves. Creighton will be a league average hitter. And because this is softball, I’m reducing the odds of an out by 10 percent for every player (encouraging offensive production), and no one will hit into double plays (because the bases are closer together). What follows here is the much anticipated, much preambled Burns-Smithers game. Joe Jackson walks to the plate. He taps clay off his shoes with his bat, Black Betsy. He winks at the umpire and the fans squirm uncomfortably in their seats. The bat is 48 ounces, 36 inches long, and not a regulation softball bat. Clemens winds and hurls, and Jackson smacks a hard liner at Griffey, deep in center field. Nap Lajoie’s up second, but bounces and out back to the pitcher. Cap Anson steps to the plate. He looks at Ozzie Smith at short, at Griffey in center and Strawberry in right, and mutters something under his curled mustache. He ropes a hard single to right, and then Honus Wagner knocks a single to left. Impressed with his sheer lack of sideburns, Mr. Burns has Gabby Street batting No. 5. Street waggles his bat, readies himself, and then whiffs on three straight pitches. The threat is ended, and the game is on. Steve Sax pops out to Gabby Street and the No. 3 hitter, Griffey, sends a loud, echoing out to Creighton in right field. Canseco walks to the plate after having walked in the second inning. “Three Finger” Brown squints in at Gabby, then slings a dipping sinker that doesn’t dip enough. Canseco rips the ball over Pie Traynor’s head for a two-run double. Contemporaries fans go wild, but Canseco’s teammates appeared reserved. Don Mattingly then dunks an RBI single into center field, and the Contemp’s lead 3-0 after three innings. Center fielder Harry Hooper leads off with a ground ball single through the right side of the infield. 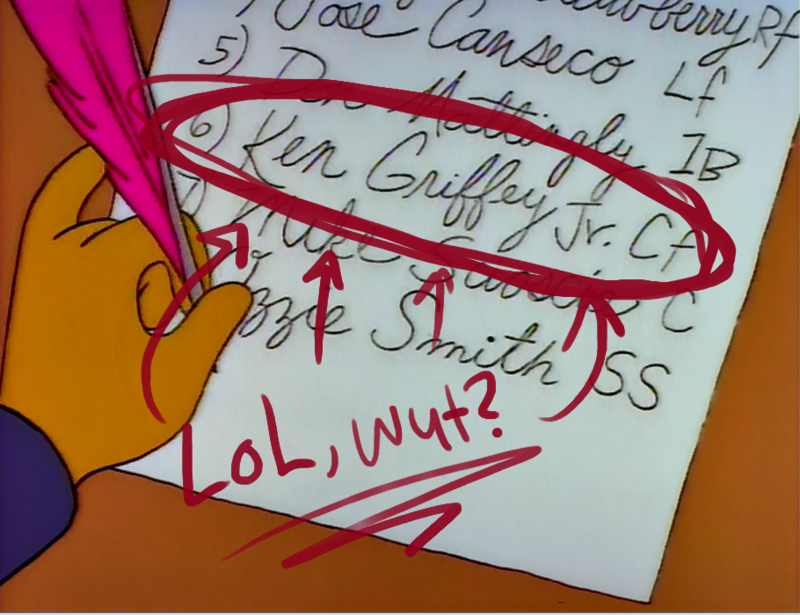 Creighton comes up, but leaves the bat on his shoulder as he watches a complicated sign from Mr. Burns. When the sign has finished, Creighton has already drawn ball four. Mordecai Brown bunts the runners into scoring position, then Jackson, Lajoie and Anson rip back-to-back-to-back singles — small-ball style. The away team fans raise their voices in hope as the Burns Anachronisms tie the game 3-3. The Contemporaries start the seventh with Clemens leading off. Knowing that Simpson has a better chance at hitting a home run, Smithers takes a gamble and sends the All-Star from Sector 7G to the plate. But without his Wonderbat, Homer finds himself outmatched against the three-digit hurler from Indiana. The lineup wraps around and Ozzie Smith cracks a single to right, followed by a Sax single to left. With runners on the corners, Griffey’s bad day continues: He pops out to Lajoie — infield fly rule — to mount his outing to an 0-for-4 showing. Canseco leans into a borderline pitch, and suddenly the bases are loaded, two outs, bottom of the seventh. And Donny at the bat. Mattingly works a 3-2 count, then smashes the ball hard! It disappears into the blue Springfield sky, then reappears through the clouds. The fans hold their breath. Joe Jackson is sprinting to the left field wall. Just the sounds of his footfalls in the crisp, green grass — no talking, no breathing, just Jackson in a dead sprint. He scales the wall. He reaches up. He stretches his glove high over his head. With Clemens out of the game, the Contemporaries turn to Canseco. He looks athletic enough to control the mound, but his pitches come in slow, looping arcs — not unlike the Shelbyville pitching staff. Street and Traynor start the inning with back-to-back walks. Smithers starts looking around the field for another pitcher. Strawberry makes eye contact, but shakes his head. It’s Canseco or bust at this point. Harry Hooper receives the three-fold, double-reverse, secret Saturday pie handshake signal from Mr. Burns. It means he needs to bunt. Hooper drops a beauty — the ball chops hard in front of the plate, and by the time Scioscia collects it, he can go only to first. One out, two runners in scoring position. Creighton eases up to the dish. “Bowl one down the center, if you’ve the gumption,” he says. Canseco assumes it was French-Canadian or some such. A fastball off the corner. “Throw a drop-ball or changepiece, and I’ll smack it clear to Yonkers and back,” Creighton taunts. Scioscia gives Canseco the sign: Fastball, outside. Canseco throws a slider. It doesn’t slide enough. Creighton lasers the ball into center field and snaps his belt in one great, violent motion. Two runs score. The Anachronisms fans are throwing their derbies and bonnets into the air. Burns calls Mordecai Brown to the dugout as the crowd settles to a murmur. “I’m bringing in the big guns,” Mr. Burns says. He waves to Otto Neu. But Neu strides to the plate and settles into the right-handed batter’s box. A bloop single to right! Runners on the corners! Joe Jackson tips his cap to Neu, then hits a lazy fly to right. Lajoie grounds out to Ozzie at short, and the game is 5-3, heading into the bottom half. Creighton is on the mound. Otto Neu is standing in right field, looking vaguely like a blur of obscurity. Creighton fires his last warmup throw, and it’s obvious to Boggs, the inning’s first hitter, that they’ve gone from Mordecai’s mid-80s fastballs to a high-70s fastball, with no secondary offerings. Boggs redistributes the first pitch into right center for a leadoff double. The Contemporaries fans are on their feet, chanting “Darryl! Darryl!” but in a supportive way. Strawberry swings at an inside fastball and grunts “Beane!” as he fires a single into right field. Otto Neu boots the ball, and Boggs scores on a trot. The Anachronisms’ lead is down to 5-4. The home crowd is ready for a miracle. Scioscia hits a high chopper to third base. Traynor moves to his left, but the ball squirts just past those weird little gloves they used to play with. Runners on the corners! Simpson comes up for his second at-bat. Creighton is stretching and rubbing his stomach. The first pitch is outside, but Homer swings anyway. A deep fly to right, and the game is tied, 5-5! It wouldn’t be on TV if it didn’t come to the bottom of the ninth, or so my spreadsheet apparently thinks. The Anachronisms went quietly in the top half, but now Griffey is looking to snap his 0-fer with a leadoff hit. He lines a single off Lajoie’s glove and he’s got the inning started! Canseco dumps a weak single into left, but a strong throw from Jackson keeps Griffey at second. Creighton appears to be struggling on the mound. Mattingly chops a grounder up the middle and Wagner has to eat it for an infield single. Boggs steps to the plate and promptly lines the ball hard, but right at Honus, who collects it for an easy out. The crowd is chanting “Darryl! Darryl!” again. He works the count to 3-1 and the fans of both teams are on their feet. A walk wins it. Jim Creighton readies himself. He twirls a fastball, and it’s down the middle. Strawberry rockets the ball into deep left-center. It bounds hard on the grass and pops over the fence — ground-rule double! Game over! Smithers disappears into the clubhouse as Mr. Burns hurls his cap at the infield. He’s jawing with the umpire as the Contemporaries mob Strawberry between first and second. It’s final in Springfield: The Smithers Contemporaries 6, the Burns Anachronisms 5. Thanks for coming out to the ballpark. You forgot the two biggest mistakes Burns made in the game- 1) He PINCH-HIT DARYL STRAWBERRY over platoon splits! Platoon splits in a softball league where Strawberry classed the league several times over. 2) After all of his ringers but Strawberry fell through, Burns left Strawberry in RF meaning that his second best hitter (Homer) was sitting on the bench. Any reasonable manager would have probably moved Strawberry over to Center to keep Homer’s bat in the lineup. I wonder if Moneyball wasn’t just a response to this episode. Ah yes, thanks for pointing that out. In the original 5300+ words version of this article, the details of that odd event were actually a point of moderate focus. We forgot to add that back into this slim, 4900-word version. Although, I’ll admit, I hadn’t thought about the fact that Homer Simpson is probably at least 1 win above Joe Beerleague, so he needed to play no matter what. At the very least, he could have played first if Strawberry didn’t want to move (although Darryl’s 15 second vertical indicates he might been just fine in CF). Literally the roots? Baseball has literal roots? Like a tree? 1. Right now we have skinny high school pitchers throwing 90 before they even have a chance to get into serious conditioning work. 2. Reported throwing distance in contests, in some cases with players throwing a ball 400+ feet. You really can’t do that unless your release velocity is over 90. Good stuff. I think if you dropped the contemporaries into the olden days, and they had to play without practice with those little gloves, terrible fields, only one umpire, fans in the outfield (they would do that for the big games so they could sell more tickets), leaving your glove in the field while you are up to bat, itchy wool uniforms, no headphones for in the dressing room, the dressing room itself, no loud music blaring from the speakers…I’d bet on the old timers. The problem is, this all depends on what rule they play under. The “Burns” team features players from the Dead Ball era. Modern players would be at a severe disadvantage is forced to play by the rulebook that existed prior to 1920. Equally, the Smithers team would dominate a game played by the modern rulebook. This is kind of like asking, who win the fighter between the Tiger and the Shark. The answer depends completely on whether or not the fight is on the land or in the water. Years ago when I was still very active on Whatifsports.com’s Baseball Simleagues, I tried out both teams. I made Burn’s team (minus Jim Creighton) with four different seasons of Three-Finger Brown as the pitching rotation and the best possible seasons for all position players, and in 3 sepearate seasons ($100 mil payroll), they won the World Series all three times. I then made Smithers’ team, with 4 different Roger Clemenses similar to above, and in three seasons, they only once made the playoffs, and were summarily bounced in the first round. Clearly – Burns knows what he’s talking about. I was a bit surprised that your discussion of how difficult it might be to translate pro baseball HOFer skills to underhanded softball didn’t mention the legendary Eddie “the King” Feigner, of “The King and His Court.” The one who struck out Willie Mays, Willie McCovey, Brooks Robinson, Roberto Clemente, Maury Wills, and Harmon Killebrew consecutively in a charity underhand softball game in 1967. One question though: Wouldn’t a Strat-o-Matic simulation have better simulated the Anachronisms vs. Contemporaries match-up? While (to my knowledge) no card exists for Jim Creighton, I reckon the fine Strat-o-people would enjoy the challenge of producing one for the experiment, which would also better simulate the base-running, pitchign and hitting balance, bunting, power, fielding, etc. I even like the look of Harry Hooper’s card. If lowering the mound after 68 increased offense by 10%, given the 0.1% per year number, that’s like a 100% change in one year. Does that mean players in 69 were no better than players at the beginning of baseball?